There are slideshows on the Internet of the house, stately and fountained, where Stephen Curry lived as a boy — the house his parents built in 1996, the year Steph turned 8, on a 16-acre plot a few minutes’ drive from the center of Charlotte, North Carolina. It’s a big house, six bedrooms. Steph’s father, Dell, played shooting guard for the local NBA franchise, the Hornets, and a couple of years earlier he’d won the league’s sixth man of the year award; the Currys saw this as their dream home, designed it themselves, had cabinets flown in from Africa. Later on they wound up selling it to another Charlotte player, Gerald Wallace, who covered every available surface with flat-screen TVs, and it’s from the Wallace era that the slideshows hail;1 still, it’s possible to imagine the Currys’ life there, the upper-middle-class childhoods resplendently sprawling over the place. Here’s the kitchen where Steph’s mother, Sonya, hung chore lists. Here’s the pool where Steph did cannonballs with his younger sister, Sydel. Here’s the lighted backyard basketball court where he waged war on his brother, Seth, where he drilled mechanics with his dad, where he shot free throw after free throw until after the sun went down. He went to his dad’s games, of course, hung out on the court during shootarounds — and you can catch the after-echo of those experiences in the preternaturally cool and impassive interviews he was already giving the media as a college kid, grounded in the calm of someone who sees nothing intimidating about the basketball spotlight because he grew up in it. He knew early on that he wanted to play for a living. YouTube has a video from around 2002, when Dell was winding down his career in Toronto, in which an almost shockingly slight and elfin-looking Steph — he’s 14 here, just a kid; still, there are eighth-graders who get recruiting letters — tells the Raptors camera crew profiling his family that he “wanted to practice some more … and hopefully make it to the pros if I have a chance.” He led his middle school team, tiny Queensway Christian, to an undefeated season that year, pouring in 40, 50 points a game. But look at the team photo. He’s maybe the third-smallest player, and that’s on a roster that includes his little brother. He was a million miles from a sure thing. He had a head for the game and the subtle knack of a craftsman born into the trade. But he wasn’t Peyton Manning. He was undersize, not strikingly quick, not strikingly athletic. He had to rebuild his shot from scratch after his sophomore year of high school because his technique, a little flip shot from the chest, stood no chance against taller, faster defenders. 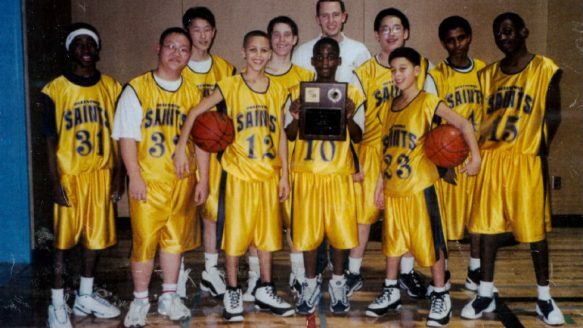 The road to the NBA is littered with players’ kids who inherited their parents’ knowledge but not their bodies; his senior year, Steph had gone basically unrecruited. Virginia Tech, where his dad had played, said he could walk on. Instead he signed with Davidson, a tiny, academically elite liberal arts college near Charlotte that hadn’t won an NCAA tournament game in going on 40 years. This, to me, is the most amazing thing about Steph Curry’s run to the forefront of the 2014-15 NBA MVP race: He seems to come simultaneously from the dead center of the game and from absolutely nowhere. He grew up in NBA locker rooms, yet he crashed into the league from the most remote satellite in the basketball cosmos. From toddlerhood, he learned the game from a career 40 percent 3-point shooter, yet his life story could hardly read less like the typical NBA bio. Even if you argue, rightly, that the post–Hoop Dreams, mean-streets/get-drafted-and-buy-my-mom-a-house cliché fails to capture the diversity of backgrounds in a league where both Steve Nash and Tim Duncan have won MVPs — well, Curry is still a player whose mother had him educated at a Christian Montessori school that she founded herself. (His grandmother was the cook.) He’s an insider who’s also an outlier, a star whose rise somehow feels both wildly miraculous and quietly inevitable. If you’ve ever seen him shoot a contested 3-pointer off the dribble, you’ll notice that both those qualities also apply to Curry’s game. Consider: When Curry pulled into Davidson his freshman year, hardly anyone knew who he was. By the end of his junior season, when he declared for the draft, scouts were plausibly arguing that the NBA would be easier for him than the NCAA was. That’s how high the degree of difficulty was for what he accomplished in college — that playing in the most competitive basketball league on the planet looked maybe a step less demanding than what he was pulling off nightly for a team in the mid-major Southern Conference. That’s the extent to which Steph — again: overlooked by every major program — hit college basketball like a quasar. Maybe you remember some of this? His first season, he finished second among all freshmen in scoring, behind Kevin Durant; his second, he broke the national record for 3-pointers in a season and took 10th-seeded Davidson on a gloriously batshit romp to the Elite Eight. “Batshit romp” is fairly unspecific, so please imagine: Steph hitting eight of 10 3-pointers in a win against seventh-seeded Gonzaga in which he scored 40 (30 in the second half); Steph scoring 25 second-half points in a comeback win over second-seeded Georgetown; Steph scoring 33 as Davidson improbably crushed third-seeded Wisconsin, 73-56; Steph scoring 25, nearly half his team’s points, in the regional final, as Davidson lost by two to no. 1 seed Kansas, which went on to win the national championship. It wasn’t just that he scored like this. It wasn’t even just that he scored like this while being for all practical purposes the only player Davidson’s opponents needed to guard. It was the sight of him doing it. This cherub-faced kid you’d never pick out of a basketball lineup. Some players look like they can do anything; others look like they can’t, until they do. And when one of the latter does it often enough, amazes you often enough that you start to expect to be amazed — well, isn’t that one of the reasons we watch sports, for that feeling of startled faith? Curry didn’t blow by people, and his footwork wasn’t what it would later become. He just kept hitting shots, in his own little bubble of imperturbable cool. He had a gift for finding the little cracks, the little aerial wormholes only players with a certain kind of daredevil vision are ever able to see. He’d run off a screen, curl to the top of the key, catch the ball, pivot: swish, over a skyline of outstretched arms. Plant in the corner, catch the ball, flick a tiny hip-fake: swish, as his defender went rocketing past him. When you never miss, all your shots feel like trick shots. LeBron flew to Detroit to watch him, and LeBron stood up to cheer. It’s important to stress here that from a historical standpoint, being a hot college shooter who jumps from a small school to the draft bears approximately the same relation to NBA superstardom as being born in the Middle Ages does to owning a castle. Curry had set the NCAA on fire, set fire to the fire, and then poured jet fuel on it, but he was still a spot-up shooter who stood 6-foot-3 with his shoes on; his realistic best-case scenario looked a lot more like, say, J.J. Redick (a role player who adds a specific dimension to his team’s offense) than Kobe Bryant (a versatile scorer who passes the “so good he gets to star in brooding self-produced documentaries in which no one else speaks” test). His dad had been a situational shooter, and that’s all Steph was really expected to be; so many players with his approximate profile never made it at all. It’s not quite fair to say that the world expected him to fail, but MVP? The short, sharp slide to Red Star Belgrade beckoned as at least as likely a prospect. 2009-10: 17.5 PPG, 5.9 APG, .437 3P%; finishes second to Tyreke Evans for rookie of the year. 2010-11: 18.6 PPG, 5.8 APG, .442 3P%, .934 FT%; wins the skills challenge during All-Star Weekend; suffers multiple ankle sprains. 2011-12: 14.7 PPG (a career low), 5.3 APG (ditto), .455 3P%; needs two surgeries after multiple injuries; winds up playing just 26 games. 2012-13: 22.9 PPG, 6.9 APG, .453 3P%, .900 FT%; breaks the NBA record for 3-pointers in a season; reaches the playoffs for the first time, losing to the Spurs in six in the second round. 2013-14: 24.0 PPG, 8.5 APG, .424 3P%; starts in his first All-Star Game; loses to the Clippers in seven games in the first round of the playoffs. 2014-15: 23.8 PPG, 7.7 APG, .443 3P%, .914 FT%; becomes the fastest player in NBA history to reach 1,000 3-pointers (in 369 games; the previous record-holder, Dennis Scott, needed 457); breaks his own record for 3-pointers in a season; overall leading vote-getter for the All-Star Game; leads Golden State to the best record in the NBA. At Davidson, Bob McKillop’s offensive scheme perfectly complemented Curry’s strengths. In the same way, every stage in the Warriors’ recent evolution, from the emergence of his backcourt mate Klay Thompson as a legitimate All-Star to the hiring of Steve Kerr as coach, has worked to Curry’s benefit; so has the overall direction of the game, which keeps placing more emphasis on 3-pointers and free throws and spacing. Still, systemic advantages matter only if you keep hitting your shots. It’s been a revelation. In college, part of what made his game a delight was that it looked so approachable. He wasn’t too fast to track or so high above the rim that he seemed superhuman; he was a regular-ish kid who kept sinking shots in colossal moments. Now? Maybe there are advanced stats to track this, but to me he looks like he’s playing in a different rhythm from anyone else on the floor. He still sees those tiny fissures in the defense, but now he anticipates them and knows how to make them wider. He has a whole magazine of little steps and turns and flutters now, moves that don’t require phenomenal athleticism so much as nerve and a killer sense of timing. (After the Warriors’ Game 2 playoff win over the Pelicans this week, someone described him as “Kawhi Leonard with ADD,” which I love.) He’s not exactly accessible, but somehow he’s even more himself — one foot on the mortal earth and one in the ether, a demigod hanging with Olympians. Sometimes the contrast shows. On Thursday night, for most of Game 3 against New Orleans, Curry looked flat, almost normal; it was Anthony Davis, the Pelicans’ young power forward, a player so in the mode of the deity-ideal that he might have sprung from the forehead of basketball itself, who dominated, leading New Orleans to a 20-point fourth-quarter lead. But the Warriors kept inching back. With 11.2 seconds left, Curry pump-faked past a flying Jrue Holiday and drilled a 3 to cut the lead to two. With six seconds left and Golden State now trailing by three, Curry missed what he thought was a game-tying shot (in fact his foot was on the line). Marreese Speights got the offensive rebound and kicked the ball out to Curry in the left corner. Four seconds left, tenths vanishing. One of those moments when you can hear your own heartbeat. Two Pelicans, including Davis, converged on him, crashing into him and into each other; a split second before they knocked him to the ground, he got off a shot. And you knew. Hindsight can be kind of a bully in sports, and it’s easy to remember certainty when all you really experienced was a kind of limbic panic. But this was Steph Curry in 2015, taking a last-second shot at the end of an astonishing comeback; maybe you didn’t understand what was happening, maybe you couldn’t quite believe it, but while the ball was in the air, you knew. The ball flew way, way up, and then, as Curry lay under Davis, it dropped through the net. Tie game. Overtime. For most of 48 minutes, Curry had not been Anthony Davis; then, for a couple of seconds at the end, he was Stephen Curry. That was enough. He opened overtime with another 3-pointer. Golden State won the game, 123-119, and took a 3-0 lead in the series. It was hard, afterward, to say exactly what had happened, except that Steph was playing, so it kind of made sense. If he wins the MVP, and I think he should, then that quality, the special joy of watching him, should certainly inform the decision. James Harden has been monstrously effective and Chris Paul is a rock, but whom would you rather see? Who makes you feel something? Why shouldn’t that count, when you’re talking about players on the highest level of a spectator sport? In 20 years, no one’s heart is going to beat faster remembering how efficiently Harden got to the free throw line. You’re going to remember what it was like to see Curry pop into open space and catch the ball, the feeling of possibility that accompanied that moment. You’re going to remember watching the ball rise toward the basket. You’re going to remember how it hung at the top of its arc, and how you already knew what would happen, and how you couldn’t look away. Here’s an actual quote from the website of NBC’s Charlotte affiliate, which did a feature on the house when Wallace listed it for sale in 2012: “Perrell [the broker] remembers Wallace s reaction when he first stepped into the two-story great room. When he walked in, he was very quiet, she explained. So I could never get a read. He said, Hm. I could put 20 TV s on that wall and his mother said That ain t happening. So, it didn t happen.” Uh, sic. Players drafted above Curry: Blake Griffin (Clippers), Hasheem Thabeet (Grizzlies), James Harden (Thunder), Tyreke Evans (Kings), Ricky Rubio (Timberwolves), Jonny Flynn (Timberwolves). Somehow, this is true even though Kerr makes him play defense. He’s not bad at it!